Anyone who knows me well knows one of my biggest insecurities is my skin. As a teenager I spent many hot summer months wearing long sleeved shirts, skirts with tights or trousers to keep myself well and truly covered up. As I’ve aged I’ve become much more accepting and proactive in addressing my three main concerns; eczema, keratosis pilaris and ichthyosis vulgaris. In short, these three indications cause me to have extremely dry and sensitive skin. Because of this, I have to be so careful with products I use; even one application of a skin product can cause my whole skin to dry, crack and peel. 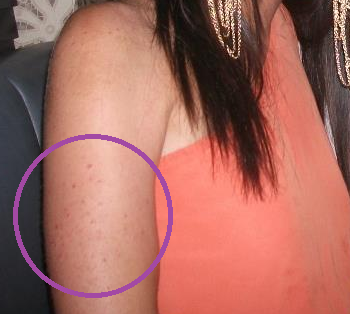 On this photo you can just see the KP (Keratosis Pilaris) on the top of my arm. Over the years I have tried endless products, any new lotion I would buy it without question. I’ve used everything on my skin in hope of a resolution; olive oil, coconut oil, aqueous creams, mineral creams, soaking in a bath of oats and splurging on £100 body lotions. I wanted to share my experience with the Ameliorate Skin Smoothing Body Lotion (now renamed Ameliorate Transforming Body Lotion ) as unequivocally nothing has made a difference like this product has! I came across the product at a MyShowcase event hosted by my friend Mel. As with most products touting far-reaching benefits I tend to approach with skepticism. However, Ameliorate contains an ingredient I know to be effective having used it in numerous different products before; lactic acid. Does Ameliorate work for Keratosis Pilaris? Chances are if you are reading this you already know what Keratosis Pilaris (KP) is. If not, the best way to describe it is chicken skin. These little red or white bumps can often be found on the skin at the tops of your arms or thighs but can appear all over the body. KP seems to come hand in hand with my skin disorders due to a build up of dry skin and keratin. Ameliorate is a alpha hydroxy therapy and contains lactic acid which works by dissolving the keratin build up that creates those annoying little bumps. I started using the Transforming Body Lotion after showering by applying it to my main problem areas; the upper arms, thighs and calves. The first few weeks to be honest I saw absolutely no change, and I was ready to consign this product to the con bin! But I had read somewhere that you need to keep going for at least six weeks so I kept at it. I’m so glad I did. By the end of week 6 my skin was the smoothest it has ever been, it felt amazing! Ameliorate is a standing fixture in the battle with my skin and I use it all over my body around twice a week. I have found that this lotion makes my dry skin appear much better – though it doesn’t cure it. The lotion creates a barrier that makes my dry skin appear “normal” almost instantly. Some people won’t like the smell; it does smell a bit odd, not bad, just not what you’d expect from a body lotion, however it is fragrance free so I’m not sure why you’d expect it to smell great anyway. In my experience if you go in the sun you will burn quicker than normal! As within any AHA you will find your skin more sensitive to the sun. It’s relatively expensive at £11.25 per 100ml or £22.50 a tube. The tube isn’t big enough! I suspect most people use this product only on one problem area but as I’m using it over my entire body I get through a tube very quickly and had to limit my use to twice a week for this reason. It will sting if you apply it to broken skin but this is just a temporary and fleeting discomfort. The packaging does state “do not apply to broken skin” so if you have very bad cracked eczema this won’t be a product for you. It isn’t a cure, you have to keep using it to reap the benefits! If I stop using the product my KP does come back after a few weeks. So ultimately my recommendation if you have KP, yes absolutely give this a try and apply it every day for six weeks before you make your mind up. If you are suffering from dry skin this lotion will work to make your skin look “good”, not perfect and not a cure, but at least enough to get those pins out! I thought I would do an update on this post. I have now been using the Ameliorate Lotion for well over a year and I can honestly say that is absolutely worth the investment for me. I have a product that means I can manage my skin and gives me so much more confidence in the summer. This would definitely be in my “essential” beauty items. So if you have KP I would give this product a try for a few months! 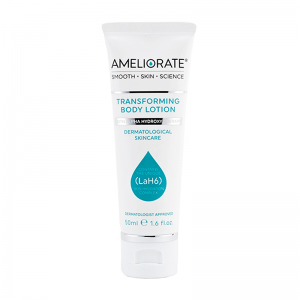 Personally I tend to buy my Ameliorate online as it’s not available in store anywhere locally, I get it from Amazon as I find it’s the most reliable.